Performing Arts Acoustics - Creative acoustics and sound design in music, theatre, education and architecture. We have experience in the design and construction of the full spectrum of performing arts venue from the very large; opera houses, concert halls, theatres, multi-purpose auditoria and fully amplified bar and nightclub venues, to the very small; sound studios, music practice spaces and alike. Sound Space Design has expertise in architectural acoustics, noise and vibration control, sound insulation design and testing and environmental monitoring. We design the acoustics for concert halls, theatres, opera houses, studios, worship spaces, lecture halls and galleries, where communication of information of artistic intent is important to the experience. We also work in the residential and educational markets, meeting and exceeding the standards prescribed by current regulations. We are world leaders in the use of acoustical modelling. We create 3D computer models of spaces, including geometry and finishes, and compute the propagation of sound within the models. The process includes sound reflections among the various boundary surfaces, generating geometry-specific reverberation and is not unlike the rendering of 3D computer graphics with light and reflections. The linked process of Auralisation creates aural simulations from the model results – sound as it would be heard in the actual space. Having been involved in the earliest efforts of auralisation and keep in touch with the scientific developments in the field, we have more experience than any other design consultants. We offer bespoke risk assessments as prescribed by the Control of Noise at Work Regulations and general advice on the issues surrounding workplace noise. Sound Space Design have in house experience of the regulations as they apply to the music and entertainment industry and can tailor our services to suit individual cases as necessary. Sound Space Design has been instrumental in the design and manufacture of two exciting new acoustical products for the music, recording and educational markets. Our Sister Company Anne Minors Performance Consultants (AMPC) has been established for over 15 years and provides services in auditorium form, theatre planning, stage engineering, audio visual and lighting design and integration. Acoustics and audio/visual design have many concerns in common and combining these two design functions within one team strengthens the contribution that both make to a project. We have a long history of collaboration with a number of specialist audio/visual (AV) designers both in the UK and abroad, and are pleased to be able to offer a combined package of acoustics and audio/visual design services. Our international collaborations include full performance sound, video and communcations (PSVC) systems design, specification and commissioning services for major North American and Canadian arts projects. 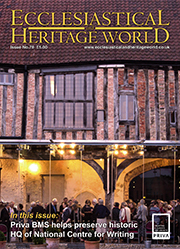 Copyright © 2018 Ecclesiastical and Heritage World. All Rights Reserved. Designed by DMM Hosting Ltd.